Bad news regarding gas revenues for Bolivia, grim future under an inept government! If world economic forecasts are correct, according to the Russian analysis, the gas prices will be forced down, and that is something that will hurt badly the demagogue government of the coca grower caudillo. Who is desperately seeking a fourth illegitimate and now also ilegal re-nomination to continue to exert absolute control of ALL State powers, close to a dictatorship. He needs liquidity fast, to continue to misled the Bolivian population who still trusts him, out of ignorance, as these people receive distorted information. The liquidity that Bolivia stills experiences comes from narcotrafficking and smuggling activities. On top of the above, this inept government engaged in billionaire loans with China, to “boost” public deficit financing, to give the illusion that this government is doing something. Until now, almost all those state-owned enterprise have only showed negative results, aside of rampant corruption that delivered ill-designed ventures. Next year will be difficult for Bolivian politics. The gas forum that was held in Santa Cruz this week, only shows the insignificant intention of contracts Bolivia got on prospecting, amounts announced in the vicinity of $1.5 billion, whereas in neighboring countries, those intentions are well over ten billion dollars. SANTA CRUZ, Bolivia (Reuters) – Global gas supplies currently exceed demand, a situation that could lead to a “crisis” drop in prices similar to what occurred in the crude oil market, Russian energy minister Alexander Novak said on Friday. 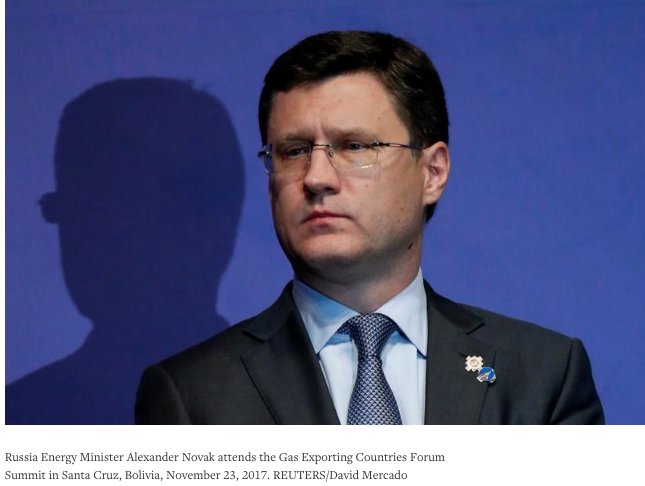 “The current excess supply of natural gas brings risks… of entering into the same crisis that affected oil prices,” Novak said at the Gas Exporting Countries Forum (GECF) in Bolivia, where top officials of major gas-producing countries have been meeting this week. Gas prices have plunged more than 80 percent in the last decade and remain under pressure due to growing supplies of shale gas and increased availability of liquefied natural gas (LNG) that can be shipped overseas. Novak said the threats to global gas prices underscore the importance of long-term supply contracts, in which producers can be assured a stable price over the course of years instead of being subject to the ups and downs of the market. Russia is the world’s second-largest producer of natural gas, behind the United States. The United States has vastly increased its output of both crude oil and natural gas in recent years as improved drilling technology opened previously inaccessible reserves – a leading reason for a steep drop in petroleum prices. The GECF, which includes members like Qatar, Iran, Russia and Venezuela, is modeled after the Organization of the Petroleum Exporting Countries (OPEC), whose 12 member nations manage oil supply to control prices. While the GECF has called for increased “cooperation” to defend its gas market, it has not applied production limits as OPEC has done to buoy crude prices.